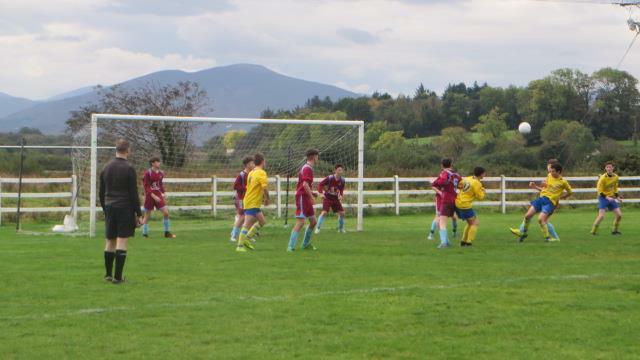 The Youths kicked off the year with a fantastic 4-3 victory over Killarney Celtic in the league in Killarney on Saturday. Stephen O’Loughlin opened the scoring after a fine through ball from Evan Madden after 20 mins. And Killorglin doubled their lead when a fine cross field ball from Eoin Clifford was taken on by Ronan O’Shea who had a lot to do but finished with a fine strike into the far bottom corner. The Celtic keeper made some fine saves from Stephen, Eoin and Tim O’Shea but as the first half drew to a close, a fine individual effort from Celtic saw the score at 2-1 at the break. 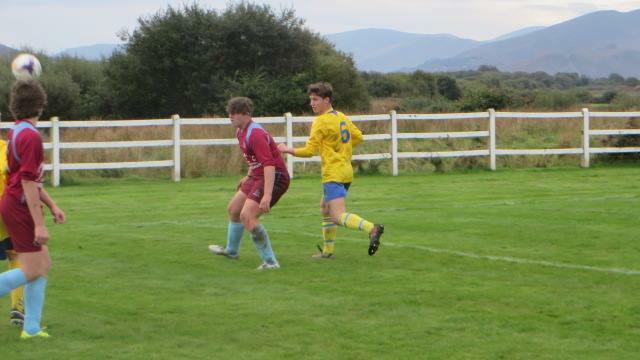 Killorglin started the second half the stronger team, and a cracking 30 yard strike from Eoin Clifford put us 3-1 up. But Killorglin couldn’t get a 4th despite lots of chances. And Celtic got themselves back into the game when a defensive lapse let them in for a second. And shortly after, they equalised from a corner. Dean Callan and Shane O’Sullivan Rouse came on and gave us some energy back, but it looked like the points would be shared, before a through ball from Eoin Clifford was excellently finished by Stephen O’Loughlin with just 3 minutes remaining to give Killorglin the 3 points. There was only one game this weekend with the Bs at home to Brendan’s Park being postponed. So that left only the C team away to Chlocain Breannain (Brandon for write up purposes). With a valuable point picked up from their previous league game, the C team were hoping for a similar performance. The game started well and 2 free kicks from Captain Kieran O’Shea, Sheazo could have taken the lead, and the 2nd hitting the crossbar. Unfortunately it was Brandon that opened the scoring when, from a corner, Michael O’Dowd headed home. Midway through the half Killorglin thought they had a lifeline when Lorca Maher was taken down inside the box but the ref saw differently. 1-0 at the break. Conor Staunton came on at half time and himself and right back Shane Flynn started to press Brandon up the wings, but it was Brandon who doubled their advantage much the same as the first half – a corner tapped in at the back post from Adam O’Donnell. Killorglin captain Sheazo had to be substituted after picking up an injury and also Dean Callan, Kevin Falvey and Manus Gallagher were brought on. To be fair, Killorglin then had a greatspell (I’m sure it was only a coincidence Sheazo), creating a number of chances with Aiden O’Sullivan getting one back for Killorglin. We could have been on level terms when Shane Moriarty just volleyed over the crossbar from a corner. 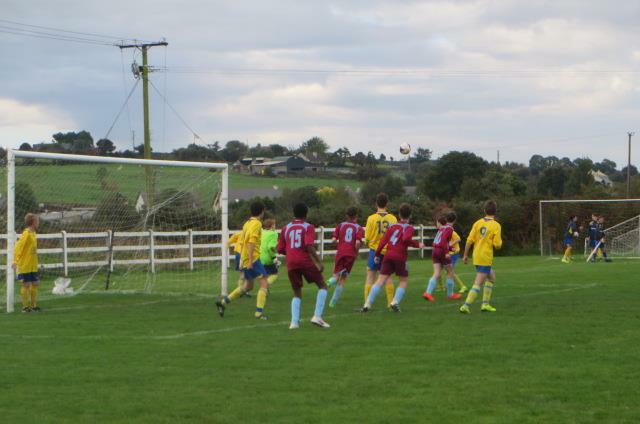 With 5 mins to go, Brandon got their 3rd (suspicion of offside) – Tadgh Kerin with a tidy finish. 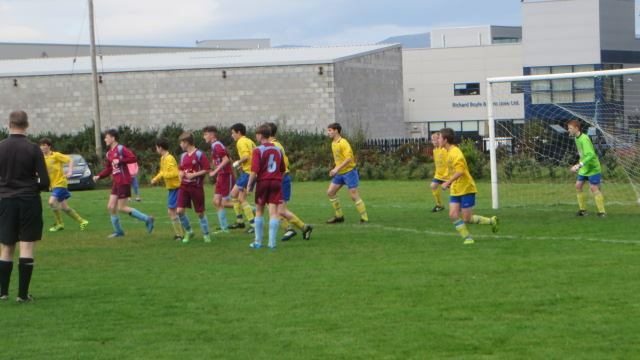 So a loss, but a lot of positives to be taken from the game against a well organised Brandon outfit. Some great performances on the day – but a mention for Killorglin’s Chris O’Connor in goal, who made a number of tremendous saves. Still a lot of work to do but that valuable point keeping us off the foot of the table. Sorry no write up last week – hadn’t the heart. 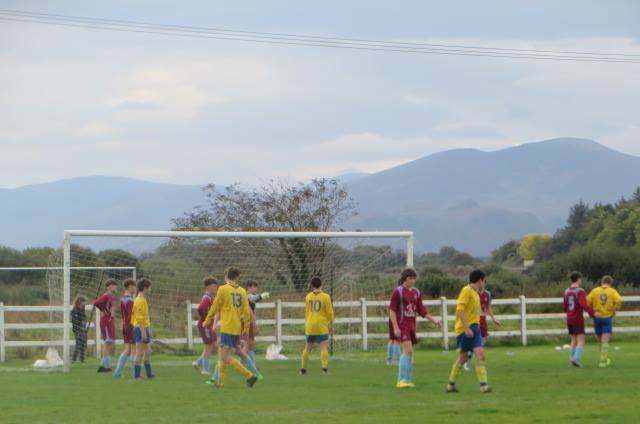 There were 2 games – the A’s played Killarney Celtic A’s AGAIN but despite a decent display we went down 4-1 eventually. Dan Whittleton with the goal. 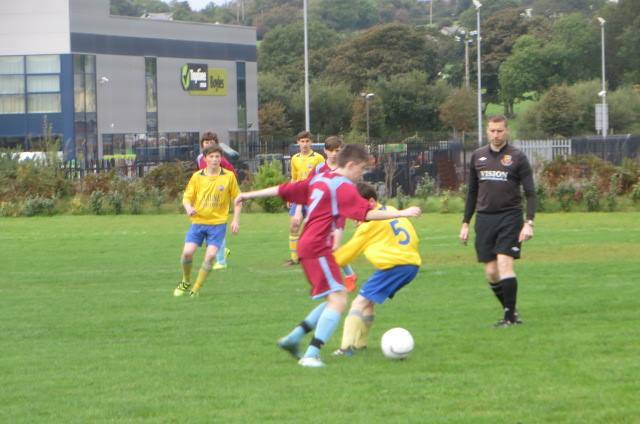 The C’s were out last sunday morning against table toppers Ballymac Celtic with a game to forget going down 8-2. Ricky Flaherty and Lorca Maher with a cracker got the Killorglin goals. Things were looking up a small bit this week the C’s were out midweek in the Dragons Den against Mainebank who they had lost 6-1 to a couple of weeks ago. A fantastic team performance saw them come away with a well deserved 2-2 draw. Killorglin coming back twice with goals from captain fantastic Sheazo (penalty) and a late goal straight in from the corner from Aiden O’Sullivan who had a great game. 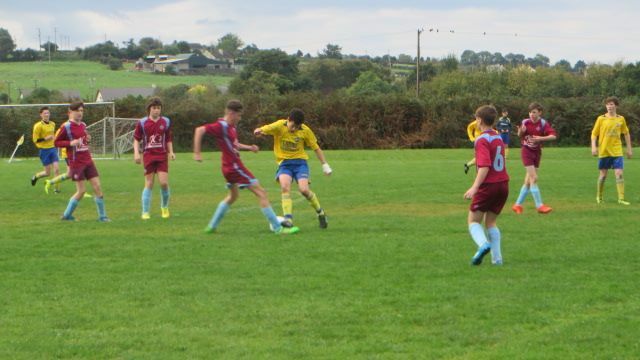 Our youth’s were away to Mastergeeha on Saturday and kept their good form going with a 4-2 win. 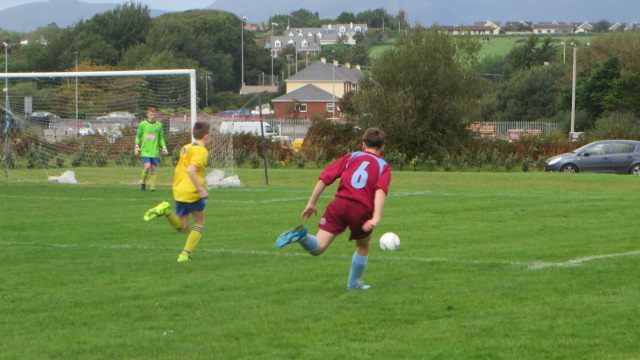 Dylan O’Neill opened the scoring with a cracking strike from the edge of the box. 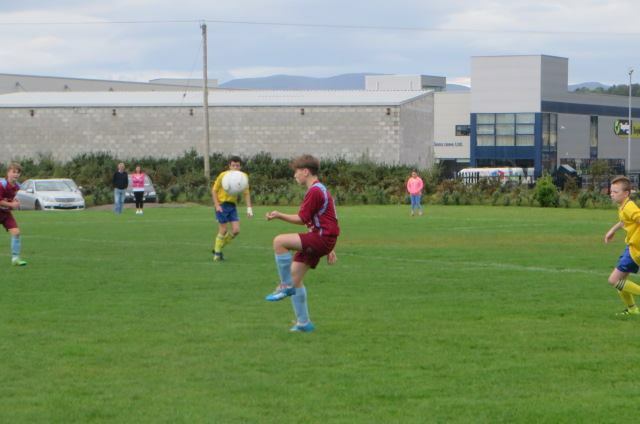 He then turned provider for Stephen O’Loughlin’s first with a great run and through ball which was nicely finished. Aaron Broderick then had a goal bizzarely ruled out when he made a fantastic run across his man to score. A mistake at the back let Mastergeeha in against the run of play to bring the score back to 2-1. 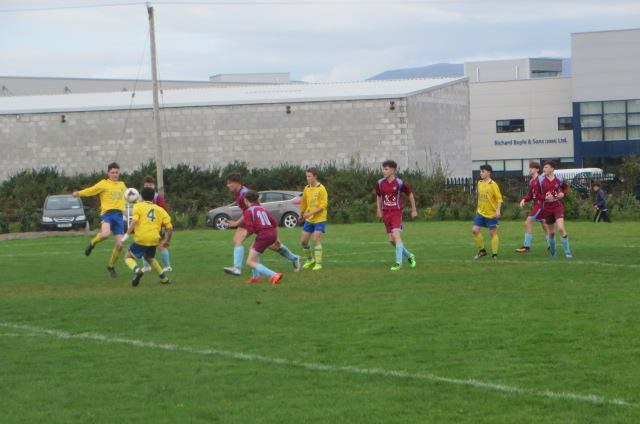 But shortly afterwards, Ronan O’Shea played a wonderful ball across for Stephen O’Loughlin to make it 3-1. And before half time, Killorglin put the tie beyond doubt when an emphatic run from Danny Considine, saw him feed Stephen O’Loughlin to complete his hat trick. A sloppy goal from Mastergeeha mid way through the second half completed the scoring, but Killorglin were unluck not to add to their tally with James Hurley, Dean Callan and Stephen O’Loughlin going close before the end. Man of the match (despite Stephen’s hat trick) goes to Dylan O’Neill with a wonderful all round performance. 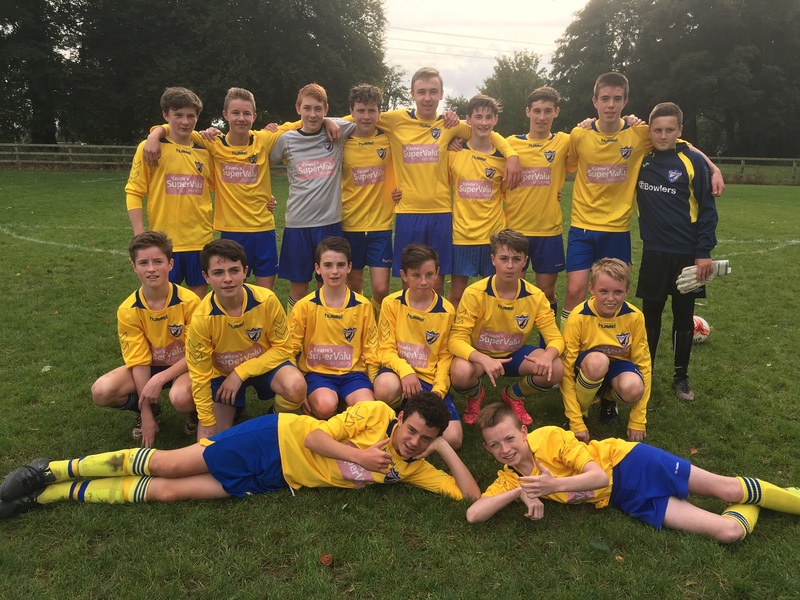 This win keeps Killorglin on top of Section B of the Youth’s League. 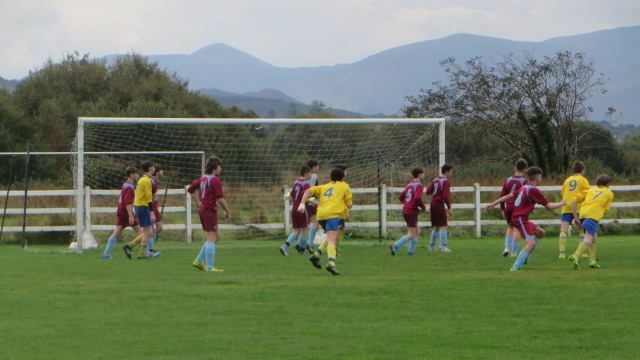 The A’s were also in action Saturday night away to Killarney Celtic B’s in the league. They also came away with a 4-2 win with goals coming from Lee Carey (2), Dan Whittleton and Tommy Cahill in his 1st game of the season (dancing career didn’t work out). Darragh Bergin also made his debut for the A’s – so Killorglin A’s back up to 3rd in the table and hopefully after a shaky start to the season they are back on track. Only one game this week with the youths in action in the 2nd round of the Munster youths cup at home to Killarney Celtic. Killorglin from the kick off had Celtic on the backfoot and were 3-1 up at the break with Stephen O’Loughlin scoring twice, and Dylan O’Neill setting up one and scoring another. Celtic’s Evan Looney got one back from a freekick just before half time. But the 2nd half continued much the same as the 1st and it wasn’t long before Stephen O’Loughlin had his hat-trick and Killorglin their 4th with a super team goal. Some great passing from the back from Stephen Sealy and Dylan O’Neill to set up O’Loughlin. 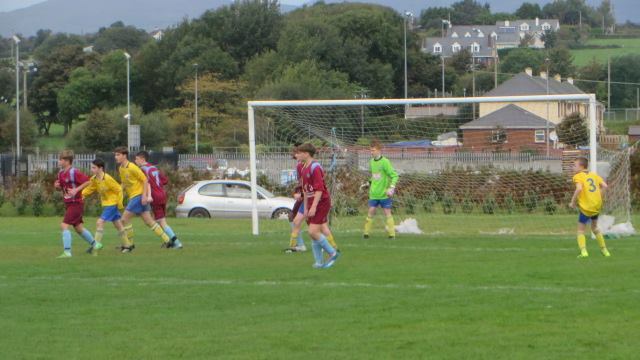 The game finished as a contest when Jack Evans found Dylan O’Neill at the back post and he made it 5-1. 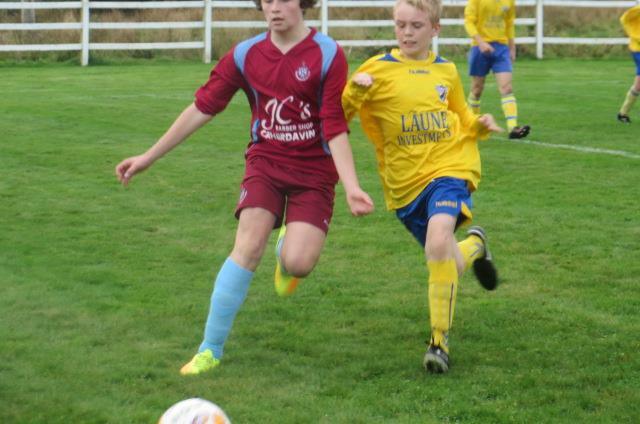 Some fantastic performances all round with Jack O’Leary having a stand out game only just back from injury. 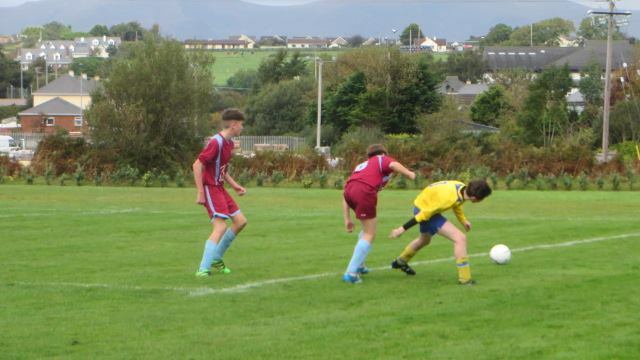 Killorglin into the 3rd round of the cup – lets hope they can keep the good form up. 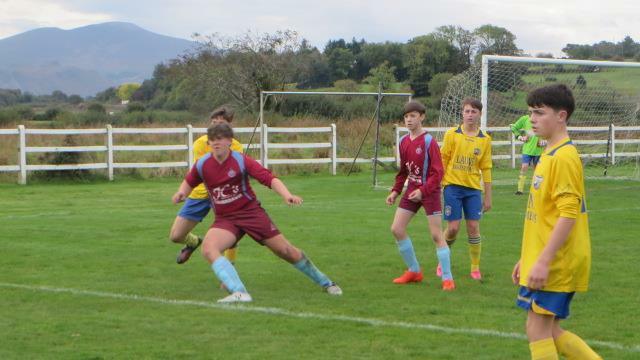 Fixtures for next weekend…the youth’s are at home to Mastegeeha 2pm on Sat 10th in the league (CANCELLED), Saturday evening in the dragons Den the B team take on Classic FC (B) at 7:30pm and then on Sunday 11:30 (venue TBC) the A’s take on Killarney Celtic “A” in the 4th round of the FAI Junior cup. All support is greatly appreciated for what promises to be a cracking game! The B’s were away to top of the table Castlegregory and after a good draw at home last weekend to Kenmare were hopeful of a good performance again. Unfortunately they found themselves 1-0 down after 3 mins. In the 29th min they were back level when Brendan Aherne scored. The 2nd half started similar to the 1st and 2 mins in Castlegregory were 2-1 to the good.Killorglin made a couple of changes bringing in Dylan Joy and Anthony Abogunrin…in the 62 min C’Gregory were 3-1 up. 3 mins later though Killorglin pulled one back when Captain Sean Costello headed home from a corner. Chris O’Connor, Ryan Riordan and Mike O’Donoghue were also brought in and in the 78th min Killorglin thought they were back on level terms when Aiden O’Sullivan headed home but the goal was not given despite the Killorglin protests. 3 mins later Killorglin had a penalty, Dylan Joy stepped up but the keeper saved so double disappointment…C’gregory added 2 more goals to add to Killorglins woes so the lads finding it tough with the step up this season but to be fair Castlegregory are top of the table. 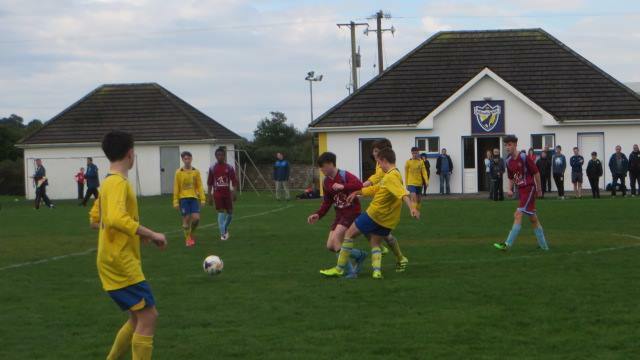 Finally the youths were also in action on sunday morning at home to Ballyhar with the game finishing in a 2-2 draw. Killorglin started the better of the 2 with chances for Conor Burke and Dylan O’Neill testing the keeper early on but unfortunately Conor had to go off with an injury. With the break in play Ballyhar got the opener but Killorglin levelled before the break when Stephen O’Loughlin scored from a Dylan O’Neill cross. 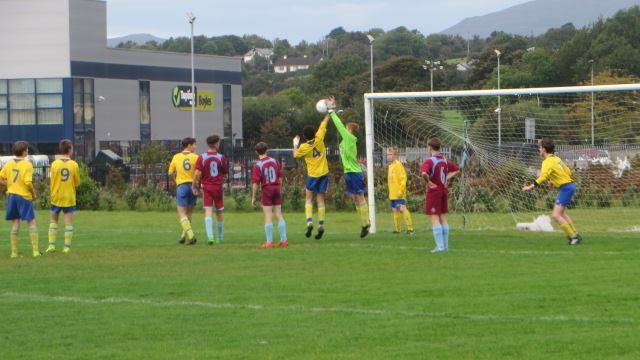 Killorglin welcomed back goalkeeper Alex O’Connor who had been on duty with the Kerry u-17’s and he made 2 fine saves but with Killorglin pushing for the win were caught out when a long ball found the back of the Killorglin net. Killorglin well on top for the final half hour introduced Ronan O’Shea, Shane O’Sullivan and Stephen Seely with both Shane and Stephen unlucky not to score. With time running out Ballyhar looking like taking all 3 pts but for a wonder strike from captain Gabriel Griffin with 2 mins left on the clock. Killorglin nearly took all 3 pts when Dylan O’Neill and Stephen O’Loughlin nearly scored but for some fine keeping to tip the ball away from both, and a point a piece was probably a fair outcome. A man of the match performance from Jack O’Leary, who was introduced early on for Conor Burke. €2 per player – please bring shinguards and water. Please collect kids at the gate afterwards. 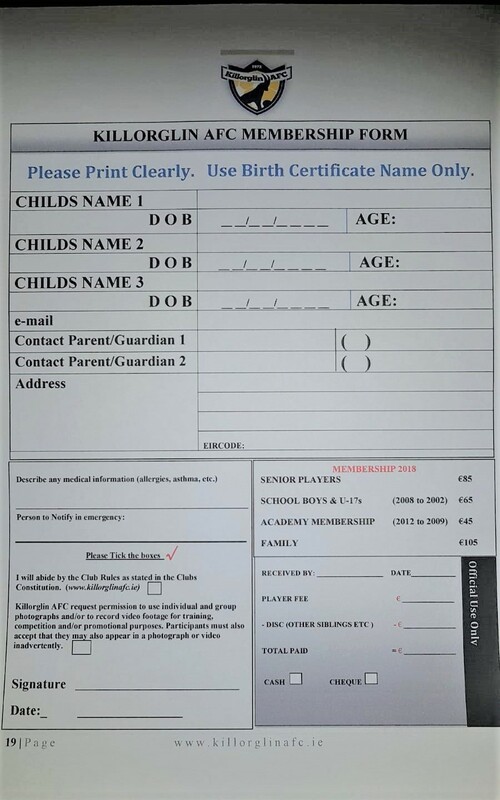 If you have not submitted a membership form, please do so as soon as possible. 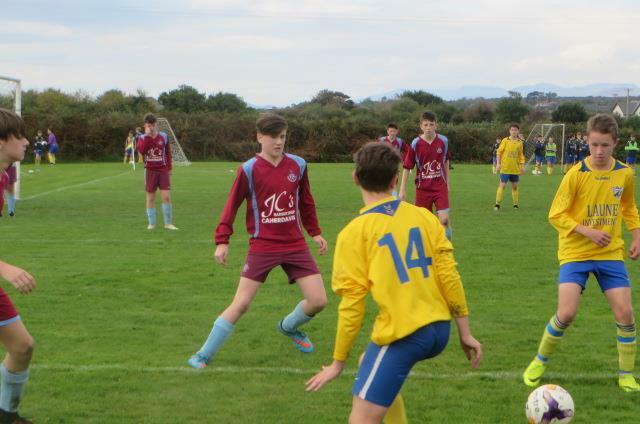 There were 2 games in the senior section this weekend with the A’s in action in the 3rd round of the FAI Junior Cup at home to Tralee Dynamos. 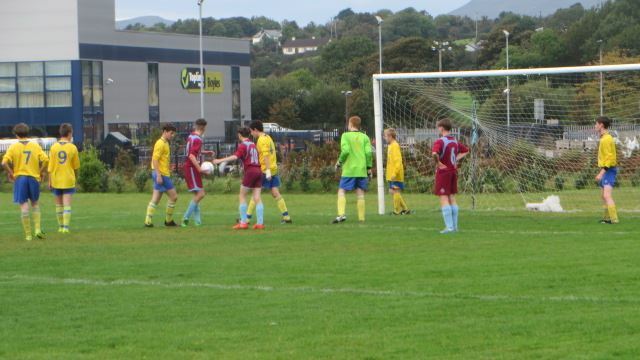 With a few players out with injury and other commitments, Killorglin were delighted to bring in some of our youth players and with Dynamos also with a young squad this looked like being a tough contest. Dynamos were quickest off the mark and only for some fine goalkeeping from Tony Lyons (not a youth player) from a free just outside the box we could have been down after 5 mins. Unfortunately after 20 mins Tony had to come off with an injury and Ricky Flaherty had to step in. 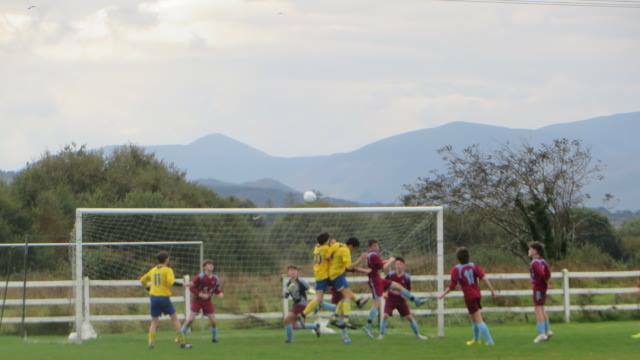 Killorglin started to settle into the game and in the 24th min. 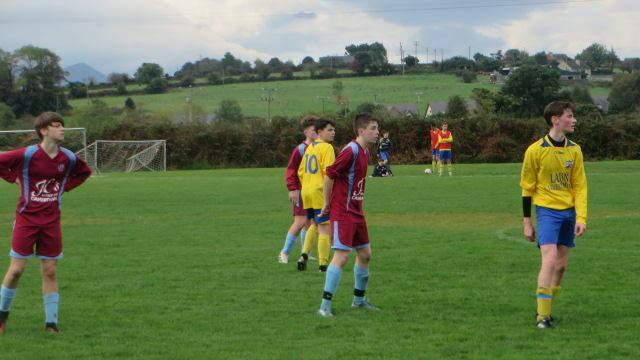 it was Eoin Clifford who, with a great strike, had the home team in front. Dynamos created some openings but were unable to capitalise and in the 35th min. Killorglin with some great work up the left wing Mike Carey crossed the ball low and hard across the box for his brother Lee to slot home. 5 mins. later it was that same combination that had the home team 3 up at the break. 5 mins into the 2nd half and Conor Standon was introduced into the back line for Paddy Collins, who was still feeling the effects of an ankle injury, and a couple of mins later Dynamos had a lifeline when they were awarded a penalty. It was well stuck giving young Flaherty no chance in the Killorglin goal. Killorglin upped the pace again and the midfield combination of Audie Dunlea and Jamie Clifford began to put the pressure on and with some well timed runs up front it wasn’t long before Lee Carey had his hatrick. Dylan O’Sullivan was rewarded for his hard work when he headed home from a fantastic Eoin Clifford cross more or less ending the tie. Dynamos did pull back another with a fantastic free kick but Ricky Flaherty great credit to him made 2 or 3 fine stops. Killorglin made 3 more substitutions, manager Gerry Kelliher giving Evan Madden his senior debut. Lee Carey added another to his tally and Manus Gallagher rounded off a fine performance with his first goal on his debut for the A team. 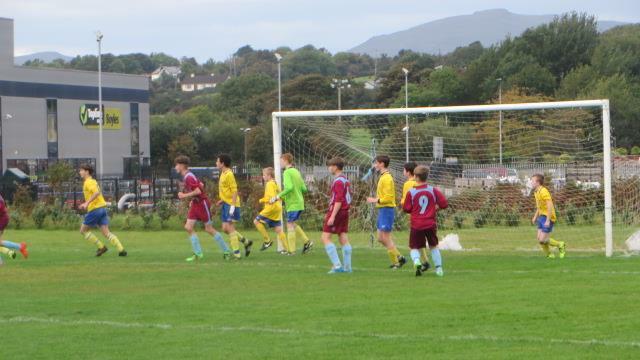 The game finished 7-2 so Killorglin into the 4th round of the cup. Some great performances on the day with a mention for youth’s Tim O’Shea and Eoin Clifford looking very comfortable at this level and also Sean Turner who had a fine game stepping up from last years B team. Team: Tony Lyons (capt), Pa Knightly, Paddy Collins, Sean Turner, Tim O’Shea, Eoin Clifford, Audie Dunlea, Jamie Clifford, Mike Carey, Lee Carey and Dylan O’Sullivan. Subs: Ricky Flaherty, Conor Stanton, Evan Madden, Ian Costello, Manus Gallagher and Ronan O’Shea. 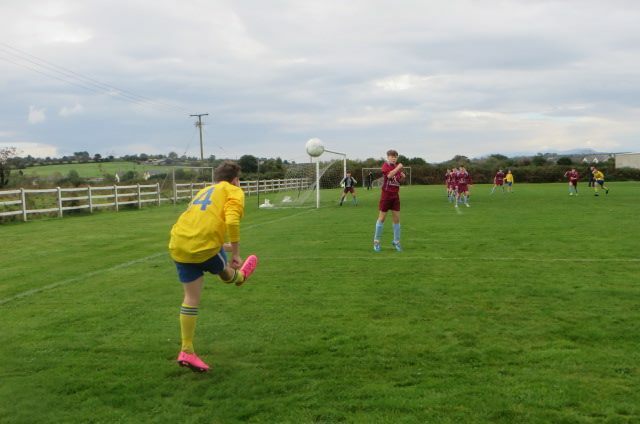 The 2nd game of the day saw the B’s playing at home to Kenmare in the 4th game of their league campaign. After last weeks defeat at home to Castlegregory, Mike Griffin and his backroom staff were looking for a big performance from their boys. 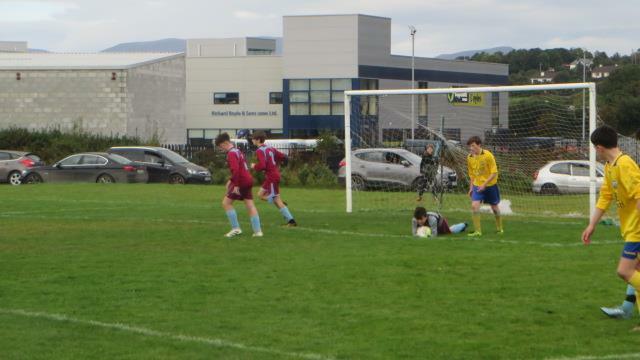 Unfortunately they found themselves a goal down when a corner not cleared was headed home at the back post by Kenmare. Thankfully Killorglin didn’t have to wait long for the equaliser when Keith Curtin found Aiden O’Sullivan who had made a great run through the Kenmare defence and cooly slotted home for his first of the season. This was a fairly even game with both sides creating openings. Both sides had chances to take all 3 points with Aiden O’Sullivan pulling the ball just wide of the post and only for some Kamikase defending from Aiden Joy the game could have gone either way. It finished 1-1 and first point on the board for Killorglin so hopefully more to come. Team: Brian O’Sullivan, Aiden Joy, Dylan Carey, Brendan Aherne, Conor Bernie, Anthony Abogunrin, Sean Costello(Capt), Keith Curtin, Darragh Bergin, Jamie Cunningham, Aiden O’Sullivan. Subs: Mike o’Grady, Shane Aherne, Kierin Whittleton, Gerome Houlihan and Mitch. €2 per player – please bring shinguards and water. 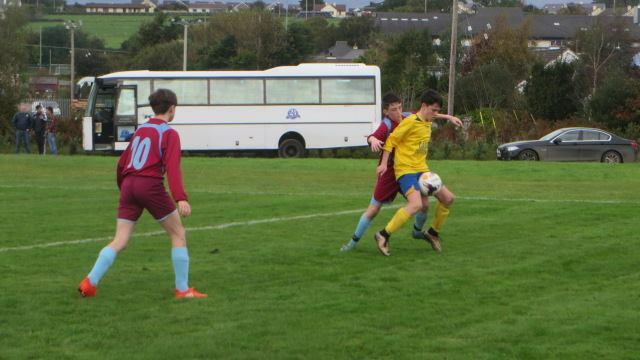 A depleted Killorglin side were beaten in the FAI youth cup in a tough encounter at the Dragon’s Den on Saturday. With 4 regulars out due to injury, a makeshift Killorglin side hosted Ballingarry, and the opening half hour was a tight affair without clear chances for either side. But just after the half hour mark, a mistake at the back by Killorglin was well finished by the visitors to give them the lead. Stephen O’Loughlin had Killorglin’s best chance just before half time, but despite controlling well, he couldn’t get a strike on target. The second half saw 4 more Killorglin regulars depart for a Mid-Kerry GAA semi final, and unfortunately this made all the difference. Ballingarry made it two in the opening minutes of the half, and looked the more dangerous side. Stephen O’Loughlin gave us hope when he latched on to a through ball from Shane O’Sullivan Rouse and finished well. But despite huge effort and commitment from all, the visitors ran out 6-1 winners. This youth team are better than the result suggests, and without so many of their usual 11, it was always going to be difficult. Thanks to Stephen Sealy who deputised in goal, Danny Considine, Darragh Dennehy and Tim O’Shea at the back, who had a tough second half but gave 100% at all times, and Aaron Broderick who looked really bright in midfield when he was introduced. Onwards and upwards! 2 games this weekend. First off with the A’s getting their league campaign underway with a tough trip away to AC athletic. AC is always a tough physical game but they’ve added a couple of players to the squad this season and from the kick off they put the Killorglin defence on the back foot. Killorglin, with a bit of an injury crisis at the moment, called on some of their youths, Eoin Clifford and Tim O’Shea. After a great game last week Eoin was substituted after a knock so newcomer Anthony Abogunrin was brought in. AC kept the pressure on and from a corner in the 21st min. David Egan headed home to give AC the lead. Killorglin were creating some chances with Anthony Abogunrin making some great runs and in the 35th min. Killorglin were awarded a penalty when Anthony was brought down in the box. 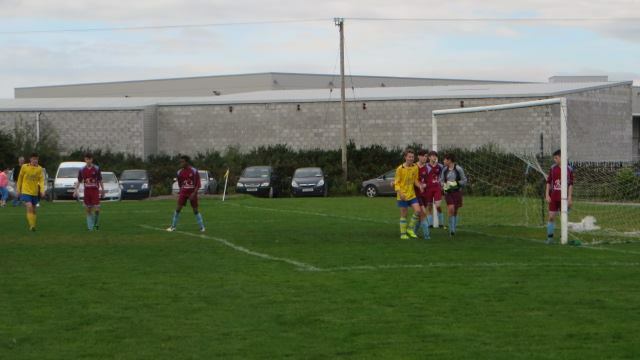 Dave Coffey took the penalty but needed his quick feet when the keeper saved but he made no mistake with the rebound. Killorglin back in the game but shortly after Killorglin were struck a second blow when David Coffey had to be stretchered off (hopefully not too serious) and Dan Whittleton was brought in. The 2nd half went very similar to the first with AC putting Killorglin under a lot of pressure. 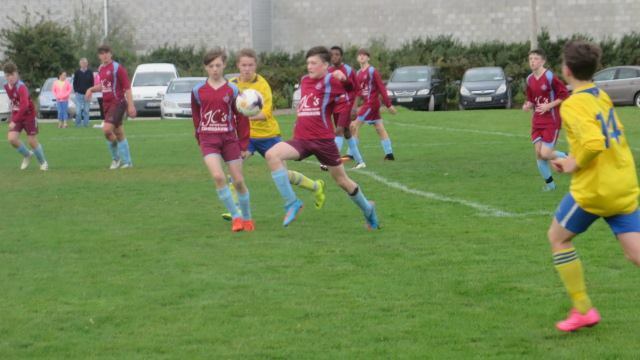 AC added 2 more goals with a great strike from Joseph Diggins, and John Buckley scored from a corner. So a loss to begin the campaign but with some new players being brought in this year, and 3 or 4 injured to come back in, hopefully better days to come. The C’s had their 2nd game of the campaign at home to Mainebank. Mainebank with promotion and a cup win from last season were going to be a tall order for our C’s in only their 2nd outing and going 2-0 down in the first 5 minutes didn’t help their chances. To be fair, for about 25 mins of the first half they played the better football and with the help of a fantastic strike from Lorca Maher (his first for the club) went in at the break 3-1 down but were still in the game. The next goal was going to be crucial but unfortunately it went to Mainebank . They added 2 more so the game finished 6-1 but with a bit more time together and a couple more games hopefully they can get that first win. Considering this is Killorglin’s 3rd team taking on other clubs with only one team, there is great credit to them. Keep it up lads. 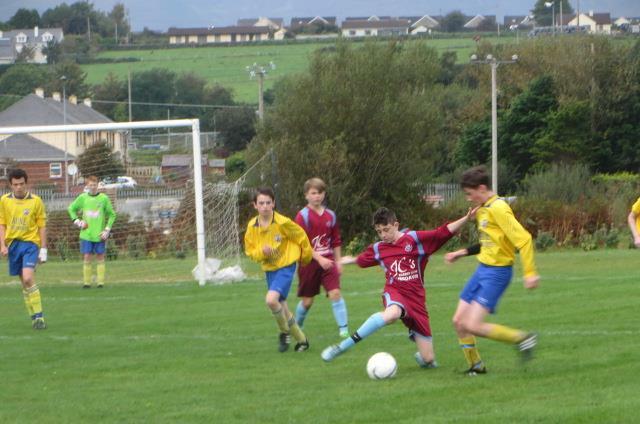 The Killorglin C team got their league campaign underway Sunday morning at home to Ballymac. With a only a week or so to get organised it was going to be a tall order but to be fair to Killorglin they showed fantastic spirit and at 1-0 down at half time were holding their own. 8 minutes into the 2nd half and Killorglin were 2-0 down. Legs were getting tired by now with a lot of the lads playing their first game in a while. 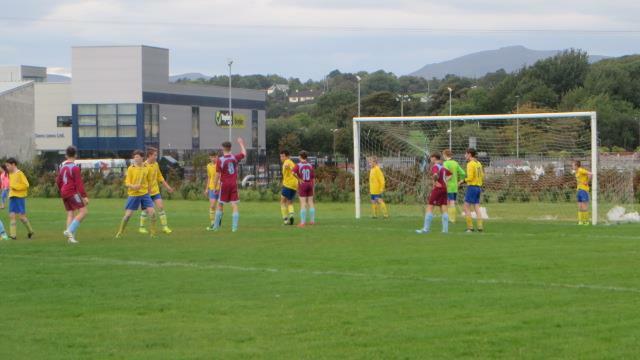 It finished 4-0 to Ballymac with Killorglin missing a penalty at the end of the game. So a tough start but Killorglin can take a lot of positives from the game so hopefully better to come. 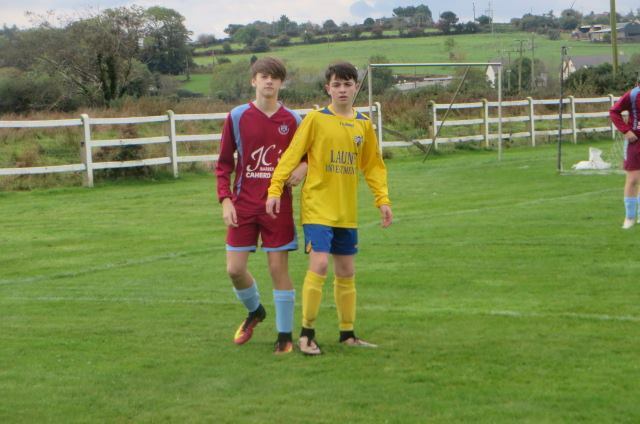 Our A’s were in action Sunday afternoon in the 2nd round of the FAI Junior cup at home to Bunratty. This was the A’s first competitive game of the season. To be fair the first half hour could only be called the “Dave Coffey show”…with goals in the 1st, 15th, 20th and 29th minutes and also won a penalty in the 2nd minute which was missed(sorry Paddy) the tie was all but over. The Killorglin strike force of Dave Coffey and Dylan O’Sullivan were on fire on the day and Dylan got his own hat-trick with some fine finishing. 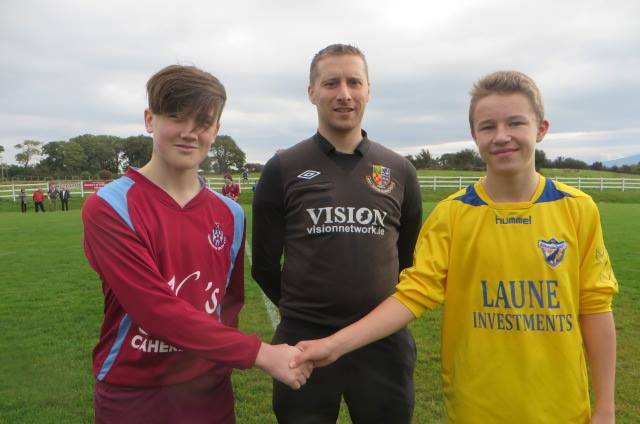 The A team had 3 competitive debutants with the Clifford brothers Jamie and Eoin and Anthony Abogunrin. Eoin Clifford also scoring twice to put the icing on a fine team display. The tie finished 9-2 but credit to the Bunratty side the game was played in great spirit. 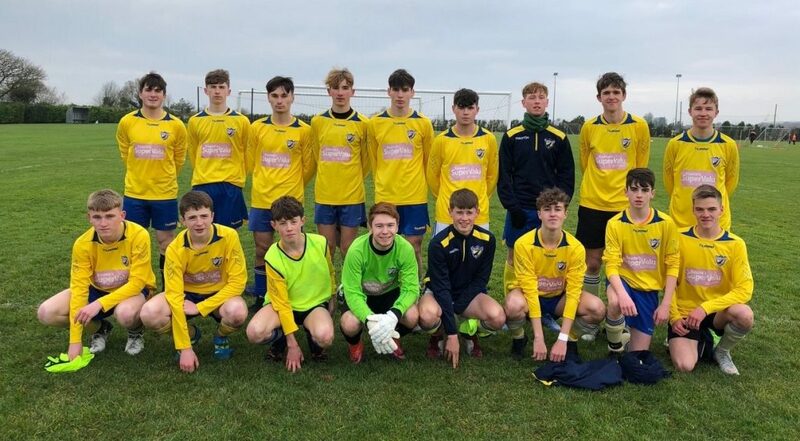 Killorglin Youths continued their winning start to the season in the Munster Youths cup in Killorglin on Saturday afternoon. 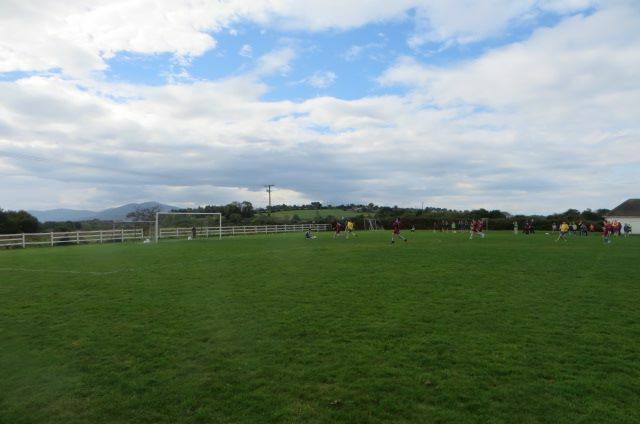 Killarney Athletic were again the opposition, and they proved dangerous in the first half, forcing Jack MacGillycuddy into a number of saves. Goal opportunities for the home side were limited. 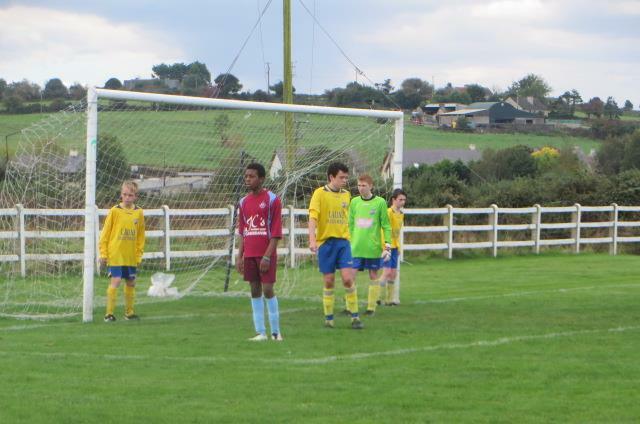 But Gabriel Griffin marshalled them well at the back, and the teams were scoreless at the break. A much improved second half display saw Killorglin unlucky on a number of occasions with Dylan O’Neill and Eoin Clifford in particular going close. 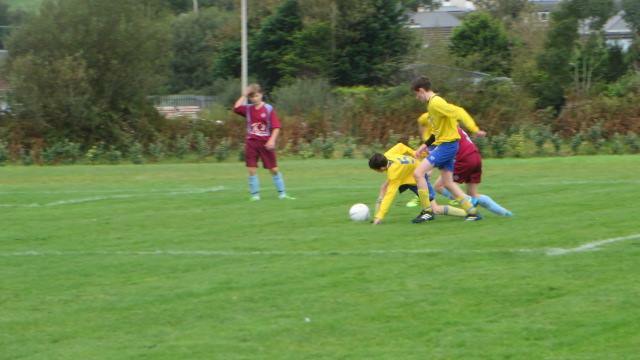 We were dealt a double blow when Jack O’Leary and Darragh Dennehy, who had put in fantastic displays, went off injured. But 0-0 at full time meant extra time. And Killorglin finally found the breakthrough in extra time. 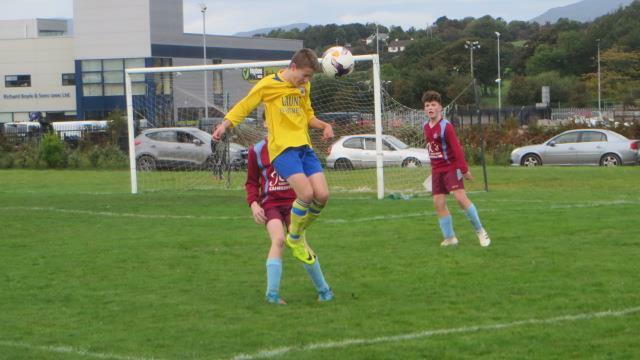 Eoin Clifford danced through the Athletic defence and a deflection past the keeper gave us a much deserved lead. 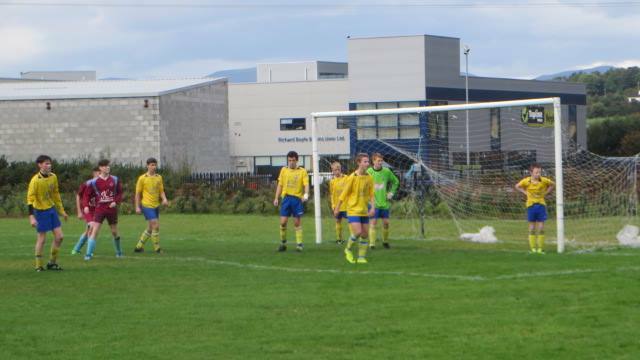 A fantastic corner routine saw Aaron Broderick flick a magnificent header in for number two. And a wonderful dipping strike from the edge of the box from Stephen O’Loughlin put the tie beyond doubt. A late consolation from Connie Cremin meant it was Killorglin that march on to a second round tie with Killarney Celtic. 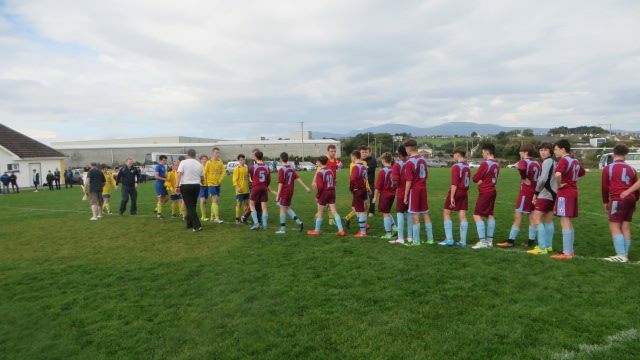 Just one game this weekend with the B team in action away to Castlemaine Utd. The B’s were hoping for something out of todays game after the losing their first game but their cause wasn’t helped when losing Jack O’Sullivan in the warm up and his brother Mikey 2 minutes into the game. In the 20th minute it was Killorglin that went closest to opening the scoring when Ryan O’Riordan broke the Castlemaine back line and struck a great shot that hit the crossbar. 3 mins later it was Castlemaine that took the lead when Shane O’Sullivan latched on to a good cross and struck well to give Mike O’Grady no chance in the Killorglin goal. In the 26th min, Castlemaine’s Cathal Moriarty doubled their lead with a great run along the end line and slotted away at the near post. Killorglin should of had a goal back when Sean Costello hit a cracking shot from the kick off which caught the Castlemaine keeper off his line which seemed to hit the net but the referee saw different much to the dissappointment of the large away support (well there was 20 or so). On the 1/2 hour mark Castlemaine made it 3 when Cathal O’Connor put in a lofted free kick that O’Grady got a hand to but it hit the back of the net. In the 53rd minute Killorglin’s day got a whole lot worse when Paul Browne was penalised for a tackle outside the box (Browne had to be substituted) and Cathal Moriarty scored from the resultant free. Killorglin did get one back in the 79th min when Anthony Abz was brought down in the box. Dylan Joy stuck the penalty so the game finished 4-1. A difficult start for Mike Griffin and his backroom staff with 2 tough away fixtures but plenty time to turn it around. 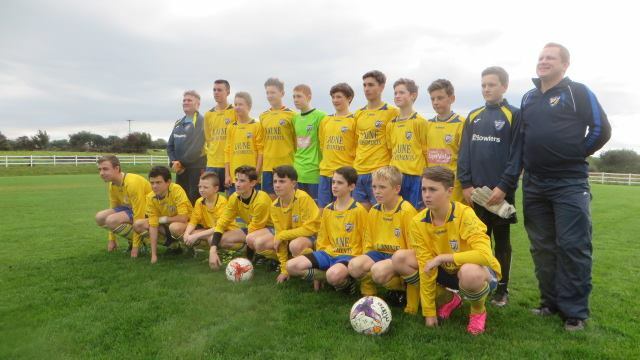 Just a mention for some of our underage teams. 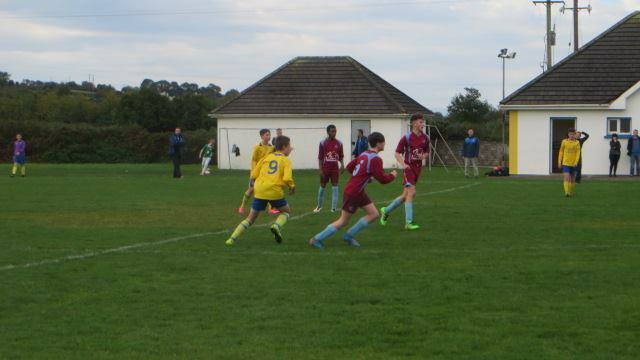 Eamonn Foley’s U-13 As had a great 4-3 win away to Tulla with after extra time. 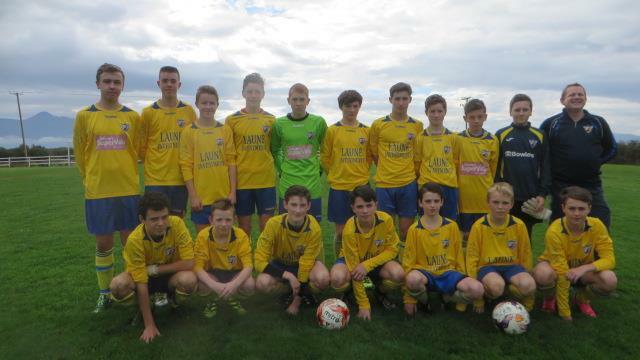 Also the U-15 As had a mighty win in the National cup beating Holycross 8-1. 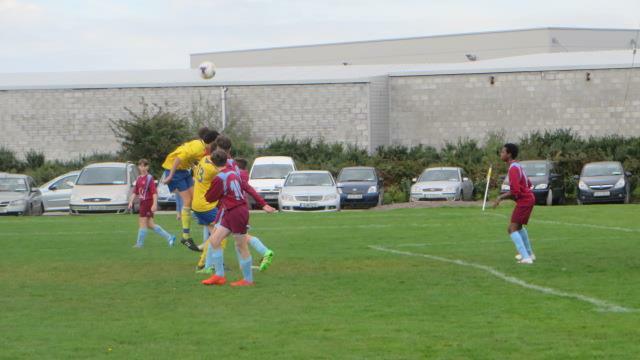 The U-13 Bs won 4-2 away to Camp and U-15 Bs had a good draw at home to Dynamo’s with the game finishing 3-3.. 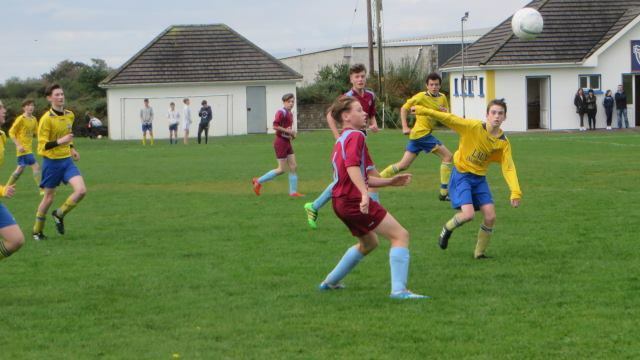 The 2018/19 season got officially underway this weekend with the youth’s and the B team getting their league campaigns underway we are also in the process of adding a third senior squad this season which is fantastic considering we had only one team a couple of seasons ago so best of luck to all. 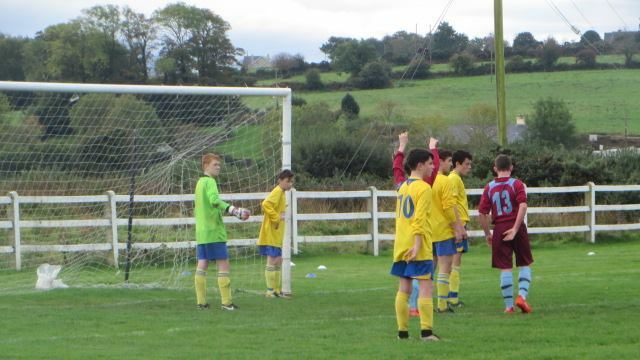 The youth’s got their season off to great start with a fine win at home to a strong Killarney Ath. squad. With Gabhan O’Loughlin, Mike Carey and John O’Connor over the what looks like a very strong squad the boys started well and it was Stephen O’Loughlin that put the home team in front within the first 5 mins. Killorglin could have made it 2 or 3 with a number of chances but didn’t convert them and it was Athletic that found the net before the break…1-1 at half time.The 2nd half could have gone either way with both sides having chances but it was Killorglin that took all 3 points when after a great run from Eoin Clifford set up substitute Shane O’Sullivan Rouse to get the winner..some great performances all round with Darragh Dennehy picking up MOTM. The B’s also in action this weekend.After securing promotion last season it’s going to be tough picking up points and no more tougher than away to Kenmare who were a Prem A side last season.Mike Griffin aided by Damien McGillycuddy and Lar O’Connor had their boys well set up and could of been ahead when Mike O’Donoghue and Sean Turner had chances…Mike O’Grady made a great stop on the 20th min. 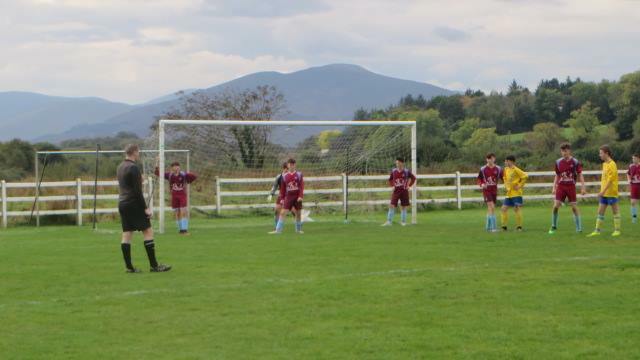 but just a minute later Kenmare were a goal to the good…Kenmare doubled their lead 10 mins later so 2-0 at the break. In the 62nd min. Killorglin were given a lifeline when Kenmare handled the ball in the box and Dylan Joy tucked away the spot kick. In the 72nd minute Kenmare had their 3rd when a horrible bounce in the box gave O’Grady no chance.Any chance of a comeback went 3 mins from time when Kenmare were awarded a penalty and they converted. Killorglin created a number of chances after this with newly appointed captain Sean Costello hit the crossbar from a free. Jack O’Sullivan did get one back for the visitors but only a consolation…so not the start we wanted but Kenmare will be a tough test for all this season so hopefully better to come…Team Mike O’Grady,Dylan Carey,Paul Browne.Jack O’Sullivan,Keith Curtin,Sean Costello(Capt),Sean Turner,Dylan Joy,Mike O’Donoghue,Ryan O’Riordan and Mikey O’Sullivan…subs Aiden Joy, Diarmuid O’Sullivan,Jerome Houlihan and Mitch O’Sullivan. The A’s yet to get their season officially underway but had a couple of solid friendlies under their belt with two 2-2 draws against the 2 newly promoted Premier A sides Tralee Celtic and Mitchell’s…Lee Carey,Dylan O’Sullivan, Ryan Keane and David Coffey all on the scoresheet..Tony Lyons had a couple of decent stops between the Killorglin posts as well(better get that in )…very pleasing was senior debuts from 4 of our youths Eoin Clifford, Gabriel Griffin, Tim O’Shea and Conor Burke all with solid performances…congratulations to them I’m sure we’ll see plenty more from them. 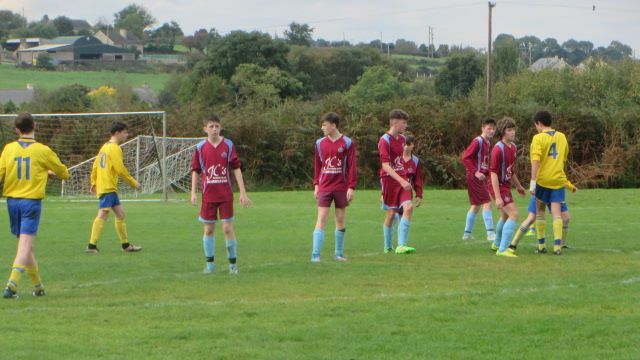 Having beaten Lough Derg FC in Killaloe two weeks ago in the first round, the Under 15s welcomed Caherdavin Celtic to Killorglin for the 2nd round of the National Cup. And what a cracking game of football. Killorglin lost an early goal when a slip at the back let in the Caherdavin forward who slotted home well. The visitors almost doubled their lead when they had an effort come back off the crossbar. 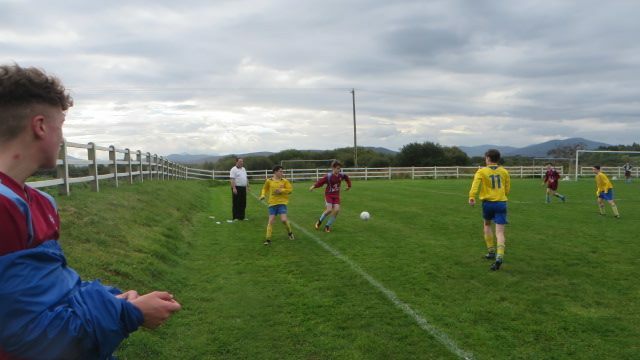 But despite the shaky start, Killorglin grew into the game and started to play the better football. 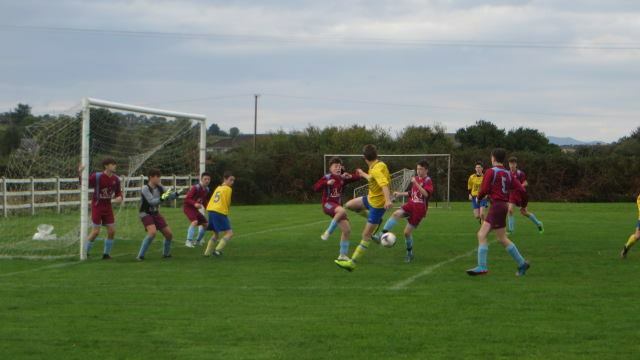 Darragh Mc, Jason and Kieran settled at the back allowing Darragh C particularly to push on, and trojan work from Jack, Kaiya and particularly Aaron in midfield gave us plenty of chances to equalise – Kaiya and Gearoid going close on several occasions. As the second half wore on, Killorglin were starting to wonder if it was going to be their day at all. Ethan and Stephen on the wings ran themselves into the ground and with 5 minutes to go it was time for some changes. Calum and Callum were introduced to give some physical presence, and with just a couple of minutes left, a flick on from Calum allowed Stephen to outpace the Caherdavin centre back and he remained cool in front of goal with an emphatic finish to bring the game to extra time. And extra time really belonged to Killorglin with Darragh C and Dylan getting the ball forward early to Niall and Gearoid (who had moved out to the wing) to keep us threatening. We looked the more likely side to win it, and Gearoid was extremely unlucky to see at least two almost certain goals deflected wide. Callum Moriarty was strong in midfield when he came on for Aaron and finally the breakthrough came with 5 minutes or so left before the dreaded penalties. A quick corner from Gearoid saw the ball break to Stephen, and this time a composed finish into the bottom corner gave Killorglin a deserved win. Unfortunately the game ended on a sour note when the visitors lost their discipline and a number of Killorglin players were carried off injured after extremely poor challenges. Frustration from Caherdavin I’m sure, but left us all the more delighted to send them packing!! 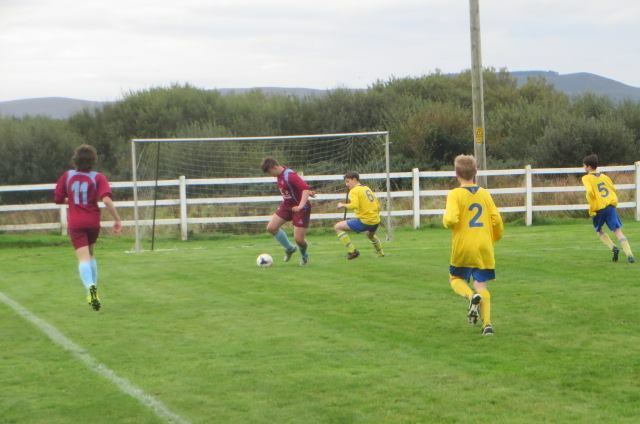 Killorglin kicked off there season with 3 points. Killorglin had a good start with Paul Costello & John Burke and opening the scoring wwas Captain for the day John Touhy opened the scoring this was followed by 4 goals from Marc Murphy whos finishing was very good with good link up play from all front 3, half time 5-0. Second half Killorglin made several changes and all subs made an impact, Andrew Owens scored 2 one which was a well taken volley from a tight angle other scorers were Stevie Gannon, Dara Crosby, Tom Garry and a top corner strike from long distance from Dara OConnor. A good team performance by all with everyone playing half a game. 1st half:Dara Crosby, Rian OSullivan, Tony Og Duffy, Fionn OSullivan, Paul Costello, John Burke, Marc Murphy, Dara OConnor, John Touhy. 2nd half: Brian Cahill, Killian Riordan, Tony Og Duffy, Tom Garry, Fionan Griffen, Andrew Owens, Jack Lynch, Stevie Gannon, Oisin Birnmingham. The AGM of Killorglin AFC will take place in the CYMS Killorglin at 8pm on Wednesday 24th June. We would encourage everyone to attend.